There comes a time in everyone’s life when it is simply just time to retire the old vacuum. Whether we like it or not, our vacuum needs to be efficient and effective. Once they no longer do what they are supposed to do, then we have to begin the hunt for a replacement. They can get EXPENSIVE if you aren’t careful! There are a few ways to prevent your wallet from springing a leak when you are on the hunt. Shopping during the springtime is one of the best budgetary tools to have in your arsenal. With the entrance of spring, comes the inevitable spring cleaning fever. Most of us have been stuck inside for far too long, and when the warmer air hits, we begin to go on a mad cleaning spree. Not only are we doing a ton of yard work before spring comes fully into bloom, but we want to get the inside of our homes in tip-top shape also. This is so we can spend more time enjoying the spring weather and less time cleaning once it really hits. This behavior has been noted by marketers and stores for quite some time now. Due to this, most stores begin running massive sales and campaigns on cleaning products and supplies. Enter, the best time to purchase a vacuum cleaner. These sales typically run from March until May but can vary based on the type of store and location. Lucky for us, we just happen to be right in the middle of this vacuum sales window! Lucky for us, we just happen to be right in the middle of this vacuum sales window! To make this deal even sweeter, most new vacuum models are released in June. This means that stores are doing everything they can to get rid of last year’s model, to make room for the new models. These last season models can be found on sale for deep discounts during the same time frame, similar to finding the best deals on appliances. Your choices of great vacuums on sale for a great price are almost limitless during the springtime. Check out these easy saving options Click To Tweet This makes making a decision much harder. But it means you will get a great deal, no matter which vacuum you end up purchasing. On top of these already stupendously great deals, there are a few other ways to piggy back and get an even better deal. Keeping an eye on weekly ads from your favorite stores can give you a jumping off point as to the price range you are looking at. Once you have identified your price range and potential vacuums, then the real fun begins. If you don’t have Ibotta yet, then you should definitely download this app. It has given us a pretty good return on products we were already purchasing, and vacuums are no different. Check your Ibotta app to see if the stores you are interested in purchasing a vacuum at are tied to it. If they are, then it’s a good idea to check once a week or so to see if they have any deals on vacuums. This app will give you money back for items you purchase that are qualified purchases during a specific time frame. It’s pretty easy to use also, which helps. If you are already planning to buy a vacuum at a discount, why not save some more money on the purchase by getting Ibotta to give you money back? It seems like a win-win to me! I simply love shopping on Amazon! It is so easy to find what I am looking for, plus they have a wide range of prices from different sellers, so that makes the choices almost unlimited. Sometimes they will have featured deals, which are usually some of the highest rated products for the lowest prices. This is the category that I like to stay in, whenever possible. Here is a great example of a brand new vacuum for under $50! On top of that, if you have the Honey extension on your computer, you can save any of the items you are looking at and Honey will tell you when the price is reduced. Honey will also tell you if it is the best deal on Amazon or not. If there is a seller with a lower price for the exact same product, Honey will let you automatically go there and add that product to your cart instead. Then, once you go to checkout, Honey will automatically search for any coupon codes that might apply to your Amazon order and apply them. This extension is simply a must have when shopping on Amazon, along with other e-commerce sites. Ebates is one of my other favorite extensions because it gives you money back, similar to Ibotta. You must launch your shopping trip through the Ebates extension most of the time though, in order to qualify for the percentage back. A good example of this is that right now, if I wanted to shop for a vacuum on Amazon, I would launch Amazon through my Ebates extension and it would open up a new shopping trip for up to 5% back. There are different percentages back for different departments, and they change regularly. So you just have to keep an eye out for when the percentages increase. Ebates will send you emails regularly about new higher percentages back at certain stores or for certain categories. So this is another good way to keep the amount of money you ultimately spend on a vacuum down. Once you follow these steps, you should easily come out on top and have a brand new vacuum to help with your spring cleaning fever. Your house, and your wallet will thank you! 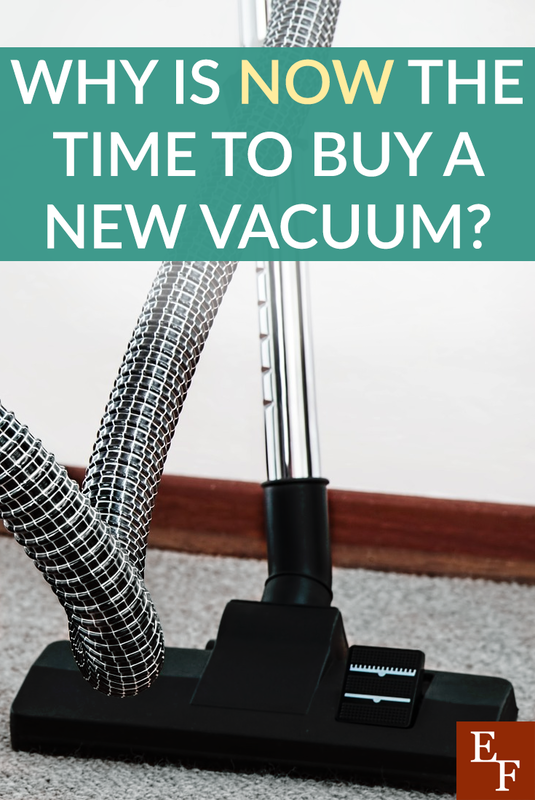 What are some of the best ways you have found to shop for a new vacuum and get the best deal?